On this special Saturday playoff edition of the Subway Fresh Take, we’ll recap second round playoff action from Class 3A and both 8-Man divisions. Nemaha Central 21, Silver Lake 14 – For the second consecutive season, Silver Lake lost in the second round of the 3A playoffs. On Saturday, Nemaha Central scored 21 consecutive points to build a 14-point lead, and got a key fourth-down stop late to preserve a 21-14 win over the Eagles. The Thunder stopped Silver Lake quarterback Dalton Dultmeier just short on a 4th-and-1 play from the Nemaha Central 17-yard line with a minute left to play. Silver Lake took a 7-0 lead in the first quarter on a Dultmeier touchdown run. Nemaha Central’s David Delaney blocked an Eagle punt in the second quarter and recovered it in the end zone for a touchdown with the conversion giving the Thunder an 8-7 lead. The Thunder pushed the lead to 15-7 at halftime after a Ryan Hasenkamp touchdown run. Mitchell Henry added a third-quarter touchdown run as the Thunder grabbed a 21-7 lead. Silver Lake scored on a touchdown pass from Dultmeier to Josh Boyd, but couldn’t overcome three turnovers in the game. Wellsville 27, Galena 22 – Wellsville never trailed in picking up a hard-fought 27-22 win at Galena. The Eagles took an 8-0 lead on a touchdown reception by Daryon Winton. Galena pulled to within 8-6 as P.J. Sarwinski hit Garrett Hall on a long touchdown pass. Reece Williams broke a 49-yard touchdown run to give Wellsville a 14-6 lead in the second quarter. After a Galena fumble, Wellsville scored late in the half to lead 21-6 at the break. Sarwinski would again hit Hall on a touchdown pass to get Galena within 21-14, but Wellsville tacked on a touchdown for a 27-14 lead. Sarwinski rushed for a short score in the third quarter to pull Galena within 27-22. The Bulldogs had their chances in the fourth quarter, but Wellsville came up with a pair of interceptions to seal the win. Rossville 34, Sabetha 28 – Two-time defending champion Rossville outscored Sabetha 21-14 in the second half to claim a 34-28 road victory and advance to the state quarterfinals next week. Sabetha scored first on a long touchdown run by Blake Plattner, but Rossville would answer with touchdown runs from Dawson Hammes and Jacob Bradshaw to lead 13-7. Trae Snyder’s short touchdown run put the Blue Jays up 14-13 at the half. Hammes opened the second half with a touchdown run and Bradshaw hit Wyatt Dyche on an option pass to take a 28-14 lead. Sabetha answered with a long drive resulting in a short TD run by Snyder to pull within 28-21. Rossville would respond almost immediately when Bradshaw hit Cole Schumacher on a long touchdown pass for a 34-21 lead. Snyder added a touchdown catch in the fourth quarter to pull within 34-28, but Rossville put together a drive that exhausted the clock. Bradshaw rushed for 270 yards and passed for 204 more yards in the win. Snyder led Sabetha with 107 yards rushing, while Plattner had 87 yards. Caney Valley 43, Osage City 16 – Caney Valley fell behind 16-0 after the first quarter before reeling off 43 consecutive points for a comfortable win. The Bullpups scored three touchdowns in the second quarter to turn the 16-point deficit into a 22-16 halftime lead. Caney Valley then added a touchdown in the third quarter and two more scores in the fourth to win 43-16. The Bullpups will travel to two-time defending 3A champion Rossville next week. Garden Plain 34, Halstead 20 – Garden Plain rushed for 358 yards in eliminating Halstead 34-20. The Owls held a slim 14-12 lead late in the first half when Nate Pauly hit Leo Larkin on a 52-yard touchdown pass go to into halftime up 20-12. Garden Plain extended its lead to 28-12 on a Marty Landwehr touchdown run in the third quarter. Pauly then iced the game with a 25-yard touchdown run in the fourth for a 34-12 lead. Pauly rushed for 169 yards and three scores, while Landwehr added 144 yards on the ground and his touchdown. Larkin had all 89 of Garden Plain’s receiving yards. Antonio Morris led Halstead with 169 yards and two scores on the ground. Hoisington 20, Norton 0 – Hoisington standout running back Hunter Hanzlick, the school’s all-time leading rusher, was carried off the field on a stretcher early in the contest with the likely diagnosis an elbow injury. Even without Hanzlick, Hoisington won, 20-0, at Norton, the first time the Cardinals had captured a road playoff game since 2006. The game was scoreless after one quarter, and the Cardinals led 13-0 with 7:18 remaining in the second, and 20-0 at the 8:56 mark in the third. Cameron Davis had all three scores and 119 rushing yards at the end of three quarters. The 11-0 Cardinals are into the third round for the second straight year. Norton (7-4) was shutout for the first time since a 17-0 loss to Goodland in Week 7 of the 2011 season. Hesston 35, Chaparral 20 – Chaparral’s Parker Patterson returned the game’s opening kickoff 93 yards for a touchdown and the Roadrunners led for more than a quarter before Hesston took control. The Swathers shut out Chaparral in the second half en route to a 35-20 victory. Hesston quarterback Zach Esau passed for 330 yards and two touchdowns, and rushed for three more scores. The Swathers led 22-20 at halftime, but Esau broke a 53-yard touchdown run in the third quarter to extend the lead to 29-20. Phillipsburg 14, Larned 7 – Phillipsburg held off surprising Larned, 14-7, in a Class 3A road contest. The Indians were hosting a playoff game for the first time since 1985 and had lost, 50-0, at Phillipsburg in Week 6. In the second half of the year, the Indians went back to a downhill running game and posted “upset” victories against Ellsworth and Cimarron in its last two contests. Senior Nate Williams, who didn’t play offense as he recovered from injury in the first Phillipsburg contest, led the ground game. Phillipsburg senior standout Mark Coomes played his first full game since he returned from a kidney problem that cost him a month. Phillipsburg held a 7-0 lead at halftime, and Larned tied the game on a 35-yard pass from quarterback Carson Smith to senior Dalton Bright with 8:15 left in the third quarter. Phillipsburg took a 14-7 lead with10:53 remaining on a 25-yard run from sophomore Treylan Gross, his second score. In the final minutes, Larned had first down at the Panther 12-yard line after a successful fake punt but couldn’t score. The Indians got the ball back again, but sophomore Nathan Moon picked off a deep pass to seal the win. Phillipsburg set a new school record for wins en route to an 11-0 start, while Larned finished 3-8. Phillipsburg has won 18 straight games. Burlingame 58, St. Paul 12 – Burlingame used a big first half to take control in winning at St. Paul, 58-12. The Bearcats led 8-0 after the first quarter, but exploded for 36 points in the second quarter to lead 44-6 at halftime. Dalton Sporing rushed for two touchdowns and threw three touchdown passes in the first half. Dominic Buterakos also scored for the Bearcats in the first half. Noah Winter’s second touchdown run pulled the Indians within 44-12 early in the third quarter, but Sporing scored twice more on the ground to end the game. Osborne 78, West Elk 28– Osborne’s offense continued to turn out big numbers in a 78-28 road victory. Osborne led 14-0, but West Elk closed to 20-14 and then 26-22 and 36-28. However, the Bulldogs scored with 2.3 seconds in the first half for a 42-28 lead. Osborne scored early in the third quarter and then again at the 4:01 mark for a 58-28 lead. In the fourth, Osborne scored three early times and the game ended with 8:05 remaining in the contest. The Bulldogs (11-0) had 46 carries for 576 yards and 11 touchdowns, including 19 carries for 308 yards and six scores from junior Denton Schurr. Cullen Grabast added 141 rushing yards and three scores, while freshman Darrien Holloway added 127 yards and two scores. West Elk ended the season at 9-2, the third time in four years the Patriots have won at least nine contests. Spearville 58, Central Plains 26 – Spearville defeated Central Plains, 58-26, in the third straight meeting between the schools in the second round of the Eight-Man, Division I playoffs. The Lancers have won 24 straight dating back to a 42-40 loss at Central Plains in the ’14 playoffs, the lone Spearville defeat since the start of 2014. Last year, Spearville won, 58-28, at home versus the Oilers. Spearville (11-0) led 28-0 at the end of the first quarter and 36-0 early in the second quarter versus the 10-1 Oilers. Spearville has outscored teams 360-8 in the first quarter this season. The Lancers took advantage of a roughing the passer penalty on its first drive en route to a score and an interception that set up the second touchdown. Spearville rushed 31 times for 339 yards. Kolby Stein, Luke Heskamp and Bailey Sites each rushed for a pair of scores. It marked the first two rushing touchdowns for Sites this year, who was first played in mid-October because of a summer baseball injury. St. Francis 48, South Central 0 – St. Francis advanced to the sub-state semifinal round with a 48-0 shutout of South Central. Taylor Rogers rushed for three touchdowns in the game and returned a punt 77 yards for a fourth score. Quinton Cravens rushed for a score and hit Tate Busse on a touchdown pass. Busse also caught a touchdown pass from Brock Waters. 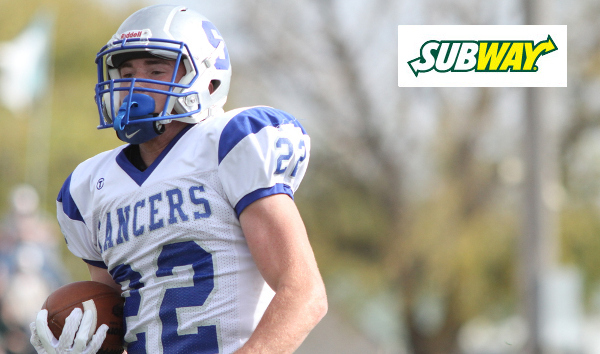 St. Francis has six shutouts in the last seven games. The Indians moved to 20-1 under second-year coach Rodney Yates and into the school’s first semifinal since 2007. The Indians will play host to Spearville in a highly anticipated matchup between two teams who have been ranked 1-2 in some order all year. Hanover 62, Hutchinson Central Christian 6 – Hanover easily defeated Central Christian, 62-6, in the Cougars’ first playoff trip in 20 years. Tradition-laden Hanover, ranked No. 1 all season, have reached the semifinals the past five years and nine of the last 10. Hanover opened the scoring with an 18-yard touchdown run from Will Bruna. Then, a HCC turnover on the kickoff led to a 16-0 lead. Bruna found Brennan Zabokrtsky for a 65-yard pass and a 24-6 advantage. Hanover led 32-6 at the end of the first quarter. Daiken Stallbaumer later added a 20-yard interception return for a 54-6 lead. On the next play, Stallbaumer picked off another pass and returned it to the 1-yard line. Hanover scored on the next play. Pike Valley 60, Hartford 14 – Pike Valley held down Hartford’s standout offense in a 60-14 win. The Panthers led Hartford, 22-0, at the end of the first quarter, and 46-14 at halftime. Pike Valley (10-1) has now tied the 2002 and ’05 seasons for the furthest advancements in school history. Hartford (9-2) won its second playoff game in program annals Tuesday and completed one of its best seasons. Sharon Springs-Wallace County 28, South Barber 0 – The Wildcats advanced to the sub-state championship game for the fourth straight season with a 28-0 home win against South Barber. Early on, SSWC stopped the Chieftains on fourth-and-goal, and the game was tied 0-0 after the first quarter. Wallace County led 8-0 with11:34 left in the first half and 14-0 at intermission. The Wildcats bumped the lead to 20-0 with 5:44remaining in the third quarter. It marked just the second time South Barber had been shutout since Week 2 of the 2012 season. The Wildcats are 7-0 in quarterfinal matchups since ’06. SSWC will travel to Dighton, which defeated the Wildcats in district play, 42-32. That marks the Wildcats’ lone loss after an 0-2 start. Dighton 51, Chase 6 – Dighton led 36-0 at halftime en route to a 51-6 road victory against Chase. The Hornets first scored on a three-yard pass for an 8-0 lead with 8:07 remaining in the first quarter and then bumped the lead to 14-0 at the end of the quarter. In the second quarter, two of Dighton's three scores came on a 57-yard pass and a five-yard scoring play as time expired in the first half. The teams were each accomplishing school history. Dighton was 3-8 all-time in the playoffs before this year and has now matched the 1995 team for the furthest advancement in school annals. The Kats were 0-5 in first round games since 2010 and won its first playoff contest since ’86. Dighton (11-0) will play host to Sharon Springs (8-3) in a district rematch.